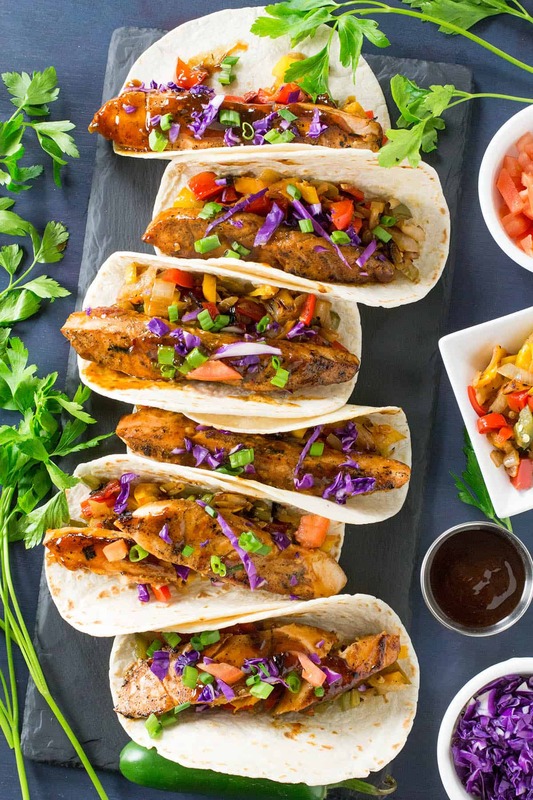 These salmon tacos are to die for, with marinated salmon cooked in spicy Szechuan sauce, served on flour tortillas on a bed of caramelized peppers. So delicious. Here is the recipe. Yeah, there is a totally new FAVE in the house. 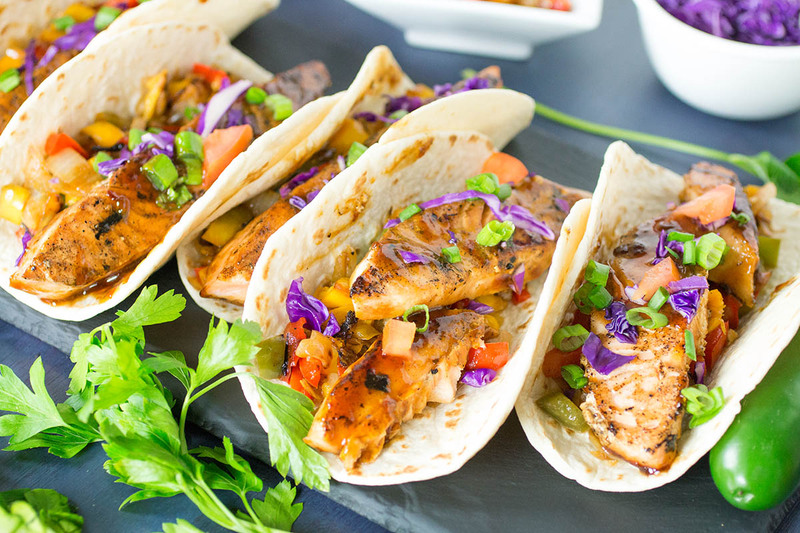 Szechuan Salmon Tacos. First bite and I was like, DANG! I NEED more of these in my life! Seriously. The truth is, though, I have had Szechuan Salmon Tacos before, and this recipe is an inspiration from that first time I tried them. The story is this — Patty and I were traveling through the Charlotte, NC area fairly recently, and when we travel, we like to look up fun and interesting restaurants. We enjoy dining experiences of all levels, but we’re more drawn to the out-of-the-way places that are known for amazing food. We downloaded the “Diners, Drive-ins and Dives” app and did a search for places that had been featured on the show. There are so many places I’ve seen on Triple D that I’d kill to visit. Drooling, you know? So onthis app, we find a place called Krazy Fish Bar and Grill in Charlotte, NC. We hadn’t seen that specific episode, but apparently Guy Fieri had their Szechuan Salmon Tacos and had all sorts of great things to say about them. I imagine it had something to do with “Flavortown” or being “Off the Hook”. PLUS! Krazy Fish has gumbo on the menu, so I was like, Heck Yeah we’re going there! The restaurant was fantastic. It’s a decent sized place, nothing fancy at all, very colorful and very comfortable, something you might find along an ocean boulevard, sort of an old school feel with a fun vibe. I’d totally hang there if I lived nearby. I enjoyed the gumbo, absolutely, but when I bit into my order of Szechuan Salmon Tacos, I had to channel my inner Guy Fieri. “Shut the Front Door! I just drove the bus head on into Flavor Town!” LOL. Truly, the tacos were amazing. One bite and I knew I had to make this at home. The salmon is dripping with Szechuan sauce, served over a bed of roasted bell peppers. Let’s break it down, the Chili Pepper Madness way. 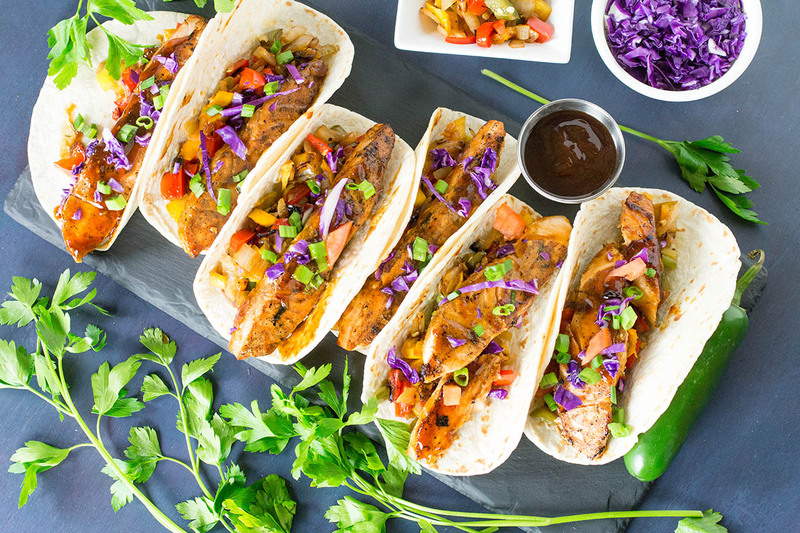 For 6 tacos, you’ll need 12 ounces of salmon. Slice them into 2 ounce pieces and marinade them about 30 minutes in a bit of soy sauce with salt and pepper. Cook down your onions and peppers in oil. I added a jalapeno pepper for extra spice, though Krazy Fish uses only bell peppers, I believe. You want to cook them a while, at least 20 minutes, until they begin to caramelize. You get much more flavor that way. For the salmon, cook them for 2-3 minutes in a hot pan with oil until they are cooked through, then add the Szechuan sauce. Szechuan is a mixture of sweet and spicy, and if you’re a chilehead like me, it’s totally in your wheelhouse. 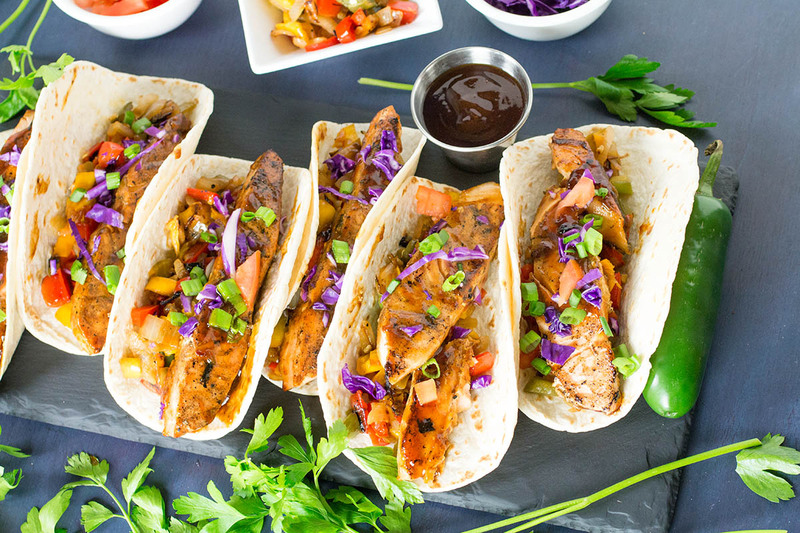 Serve your salmon on warmed flour tortillas on top of the caramelized peppers and onions, then have fun with your toppings. I didn’t want to go crazy, as I wanted to highlight the flavor of the salmon, Szechuan sauce, and veggies, but I did add some chopped green onion, purple cabbage and herbs for a pop of freshness. I also wanted some hot sauce for serving, but not just any hot sauce. I mean, hot sauce is GREAT, right? Yeah, you know me. I wanted something with a bit of an Asian flair, so I made this: Spicy Chili-Carrot Hot Sauce. Give it a whirl! It’s a nice addition. I hope you enjoy the tacos! Let me know how they turn out for you. — Mike H.
Considering I did NOT order them in the restaurant and stared at them longingly the whole time Mike ate them, I was extremely pleased that he decided to do his own version. They really are delicious. I can’t wait for him to make them again. Extra toppings for serving such as chopped green onion, shredded cabbage,chopped parsley, hot sauce, etc. Slice the salmon into 2 ounce pieces and set them into a baggie. Pour in the soy sauce along with some salt and pepper. Marinate for about a half hour while you cook your pepper and onions. Heat the olive oil in a large pan and add the onion and peppers. Cook down about 20 minutes, until the veggies soften and begin to caramelize. They will be very soft and beginning to brown. Remove from heat and set aside. In the same pan, add 1 tablespoon olive oil and heat. Add the salmon and cook about 2-3 minutes per side, or until cooked through. Add the Szechuan sauce and swirl to warm the sauce. Remove from heat. Warm the tortillas and top each with your onion-veggie mixture, then salmon, then your toppings. Add extra sauce if you'd like! Makes 6 good sizes tacos. So good! Try this for serving: Spicy Chili-Carrot Hot Sauce. Ink is very expensive! I just want the recipe, not all the color photos! REPLY: Steve, there is a simple PRINT function below the recipe in the social media bar. Click that and you can remove whatever you don’t want to print. — Mike from Chili Pepper Madness.